The Ireland pairing will join a team of 11 pundits for the broadcaster’s coverage in Russia this summer. The Ireland duo will work with ITV after Ireland failed to qualify for the 2018 World Cup. 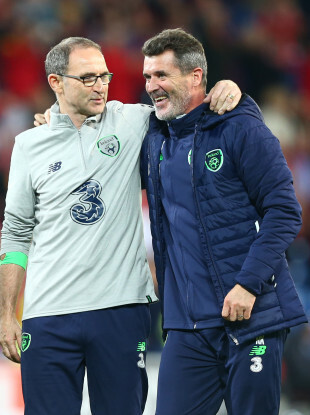 MARTIN O’NEILL WILL join assistant manager Roy Keane as part of an all-star punditry team including Gary Neville for ITV’s coverage of the 2018 World Cup. The Ireland pairing will join a team of 11 pundits that includes Keane’s former teammate and Sky Sports pundit Neville, with ITV’s acquisition of the ex-Man United defender a real boost for the broadcaster’s coverage. The popular pundit will work with Keane, who often causes debate on his analysis and O’Neill, who is also known for his straight-talking demeanor. The duo are free to work as pundits after Ireland missed out on qualification in a 5-1 playoff defeat to Denmark last year. Former West Ham manager Slaven Bilic will return to ITV after featuring during Euro 2016, while Patrice Evra will make his punditry debut during this summer’s tournament. Euro 2016 final referee Mark Clattenburg has also been confirmed to join the team, and will bring an added dimension to coverage with his experience as a top-level official. Also joining ITV regulars Lee Dixon and Ian Wright in Russia will be Wales manager Ryan Giggs, former Sweden striker Henrik Larsson and England women’s forward Eni Aluko. ITV will host 23 matches from the group stages and 32 in total including the knockout stages. The final in Moscow on 15 July will be broadcast by both ITV and BBC. Email “O'Neill and Keane to join Gary Neville for ITV's World Cup coverage”. Feedback on “O'Neill and Keane to join Gary Neville for ITV's World Cup coverage”.